The bulletin directed new people to the welcome desk to get a welcome badge so people could identify and welcome guests during coffee hour. So I went to the welcome desk, expecting some kind of button with “Welcome to X Church” on it. Oh no. They gave me a huge circle with my name in capital letters that covered the left side of my chest like a target. Make your congregation do the work of identifying guests, don’t find embarrassing ways for guests to self-identify. Encouraging your congregation to engage in visitors is important—sometimes people need a reminder. But never, ever do it in a way that singles out guests or makes them feel awkward. You might as well hand the newbies a dunce cap and ask them to stand in the corner. A better approach is to simply train your congregation (maybe even a dedicated “welcome team”) to approach people they don’t know and talk to them. Make your congregation do the work of identifying guests, don’t find embarrassing ways for guests to self-identify. Recently my wife and I visited an international church in a Mediterranean country where newcomers and visitors were invited to stand up during the service and introduce themselves. On balance I think it worked in that particular context because it gave a sense of the range of backgrounds and nationalities of the visitors (many of whom, like us, were on holiday) and it led to some interesting conversations afterwards. I’d say that this is an exceptional situation: don’t try it at home. We once visited another church where everyone who held a specific post had a printed badge with their name on. Surprise… the wearers of these badges had a distinct air of self-importance which I found very off-putting. In our own church we have badges which are worn by people performing specific duties on the day (e.g. welcome team) but these only indicate the role: we are here to serve. Occasionally we ask everyone who comes to a service to hand write their name on a sticker and wear it so that everyone else can see it as an aid to getting to know each other. Everyone is treated the same, whether newcomer or old timer. 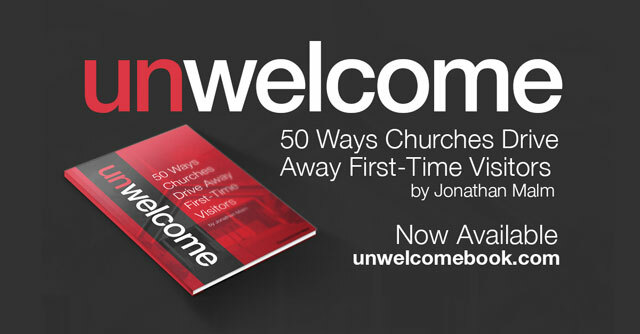 In the end you can’t turn an unwelcoming church into a welcoming one just by handing out badges. I introduce myself as if I’m the new person, and I’ve been at this church 3 years. This puts the focus initially on me and breaks the ice without the other person feeling attacked… seems to work well.